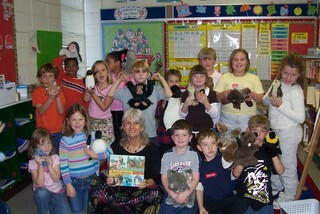 I love to talk with children about writing my books and using their imagination. I bring props, powerpoint presentations, and lots of enthusiasm to schools and libraries. Here are some of the programs and workshops I offer to classes K-12. o From the page to the stage: children join in a reader's theater and act out the adventures of Katje the Windmill Cat. o Animal Music: Honk like a goose, and chatter like a chimp as we read Animal Families, Animal Friends, and learn how animals live together and help each other. o What Does a Writer Do All Day? Daydream, travel the world, crumple up paper and throw it away, and never give up. o What's in a story? I adapt my programs for different grade levels and all involve student participation. Contact me for details and fees. See teacher's guide for Answering the Cry for Freedom under My Books. For classroom activities to accompany Jeannette Rankin: Political Pioneer. see the Rankin entry under My Books. Discussion questions for All the World's A Stage: A Novel in Five Acts can be found in My Books. "We’ve had a lot of authors come and talk, but your visit was probably the most interesting so far." "I love to write and I do more because you came." "The story writing process really encouraged me to start writing stories. Be prepared for some e-mails because I might ask you if the story is OK or not." "It was really interesting, learning about the long, involved process an author’s story must go through before it’s finally published….I will send my prize-winning story to an editor as soon as possible." "I enjoyed your lecture at the middle school. Unfortunately, you broke one of the basic rules – it wasn’t boring." "If I was the first editor you sent Katje the Windmill Cat I would have taken it in a heartbeat. That story just plain rules." "I really want to be an author when I grow up. You coming to our school made me really want to become an author even more."